If Sackville Town Council agrees to support the New Brunswick ATV Federation on Tuesday, it would join a growing list of New Brunswick municipalities who have said yes to allowing ATVers to ride on town streets with other local traffic. An e-mail from Jacques Ouellette, the ATV Federation’s Development Coordinator, points out that so far, the province has approved the use of ATVs on roadways in seven municipalities and applications are in process or pending in seven or eight more. As previously reported, the ATV federation is asking Sackville Town Council to write a letter to support allowing riders to use Mallard Drive, cross the McDonald’s intersection at Main Street and travel along Wright Street to and from ATV trails in the area. If council agrees to support the proposal, the federation would submit its request to the provincial Department of Transportation as well as the Department of Justice and Public Safety. Ouellette lists the following places where, he says, ATV riders have been granted legal access to municipal streets: Edmundston, Bathurst, Saint-Quentin, Kedgwick, Shippagan in winter, Dalhousie and Tide Head. He says other places that are supporting the ATV federation’s request include Blackville, Belledune, Memramcook, Neguac, Tracadie, Peticodiac, Bouctouche and Grand Falls. Ouellette says that at first, there was opposition in Bathurst to sharing town streets with ATVs. “For the last 4 years we have been using the three streets, police patrollers reported to us that they received very few complaints, nothing worth mentioning,” he adds. In a telephone interview, Ouellette said that ATVers want to be able to travel along Mallard and Wright, not only to get access to their trails, but also to be able to use the restaurants, gas stations, the hotel and grocery store in the area. He says the local Tantramar ATV Club generates $5 million in benefits to the local economy each year, a figure that could easily double if ATVers get legal, controlled access to town roadways. This entry was posted in Town of Sackville and tagged Jacques Ouellette, New Brunswick ATV Federation. Bookmark the permalink. I personally worry about ATV’s safety/cars’ safety more when I see them crossing the highway than when I see them in towns. This being said, I agree with Azi that ensuring the safety of our roads first would matter. From the earlier article, I like Councillor Bill Evans’s idea of basing his decision on the advice from RCMP. I also like Tower’s suggestion to try it for a year and see (however, in Sackville, you never know… a one-year trial may last an eternity if we think of the town’s *temporary* ban on drive-thrus :)). If I am not mistaken, in some municipalities in Ontario (and maybe in Quebec? 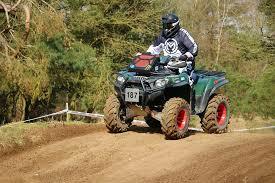 ), they sometimes impose a speed limit on ATVs, that is slower than the one on a particular street. They also have rules about limiting access of ATVs to roads/streets in certain times of the day and in some seasons. Will it help if we do the same here? For instance, after high school operations or rush hours or times of buses’ arrival to the Irving station when Mount A students/other passengers step out? Finally, just as an example that sometimes things can work well, even in busy cities. I have a friend (banker in Beirut) who goes to work on his ATV (wearing his tie and suit :)). He has been doing this since 1990. Maybe he is crazy? Maybe he is careful or just lucky? Anyhow, he is still alive… and in one piece, thank Goodness!